I've been meaning to get around to this for a long time. Here is a video that shows every stage of making your own Traveler's Notebook. It includes some optional steps, like rounding off the corners and adding a bookmark. 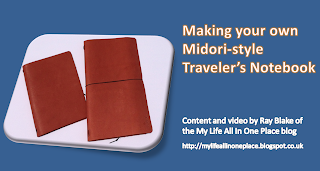 I hope you enjoy watching, and perhaps making your own Traveler's Notebook. Thanks for the great video. I made today my own. The tips are an extra help. I noticed that you also made DIY Midori out of thick black leather. 3mm thick I think? Now that you have used both for awhile which do you prefer, the thick leather or the thin? What are the advantages/disadvantages to each? Thanks again for such an awesome site. They each have their pros and cons, of course. The thick stuff is more rigged but hard to get a good fold established. The thinner leather is softer but might not stand up to the abuses an outdoor lifestyle might throw at it. I like both. Thank you for making this video. I inherited some rather large pieces of leather in various colours years ago and have never known what to use them for. Looks like I've just found the perfect use for them.